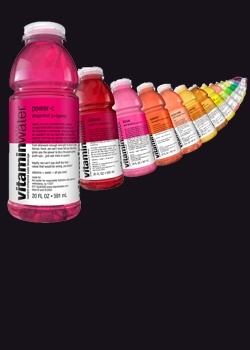 Vitaminwater is a great-tasting, healthy enhanced water that is packed with nutrients. in addition to providing a perfect complement to everyone's less-than-perfect diet, each vitaminwater variety has a unique combination of nutrients to deliver a specific benefit to get you through your day. a recently-completed clinical study proved what we have known all along: the vitamins in vitaminwater power-c (dragonfruit) are absorbed by the body equally as well as those in traditional foods. smartwater ? the water with all the answers - is a zero-calorie, vapor-distilled, electrolyte-enhanced water. just the purest, cleanest water possible with added electrolytes. fruitwater - the natural way to diet - is a low-calorie, lightly-flavored water that is enhanced with a touch of pure crystalline fructose, a high-quality, natural sweetener that is the same as found in fruits and vegetables.